Celebrate…it’s Carnival! 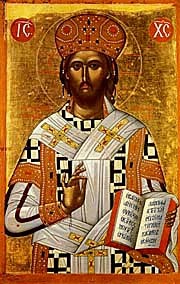 While we celebrate Epiphany on a Sunday, traditionally Epiphany is January 6th, the Twelfth Day of Christmas. Epiphany is also the beginning of the Carnival Season. Carnival is not a liturgical season on the Church’s Calendar. But is does have many connections with our faith. The word “carnival” literally means "farewell to the flesh". 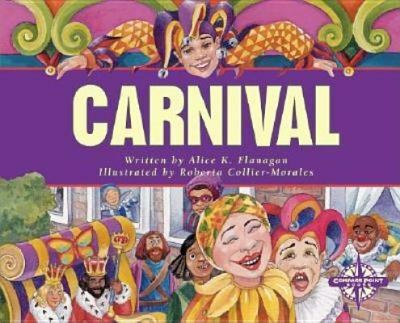 The carnival season lasts from Epiphany through Shrove Tuesday (or Mardi Gras), the day before Ash Wednesday. dairy products, etc., were eaten at all during Lent. So what did you do with the eggs, oil, milk, etc., that you had at home? 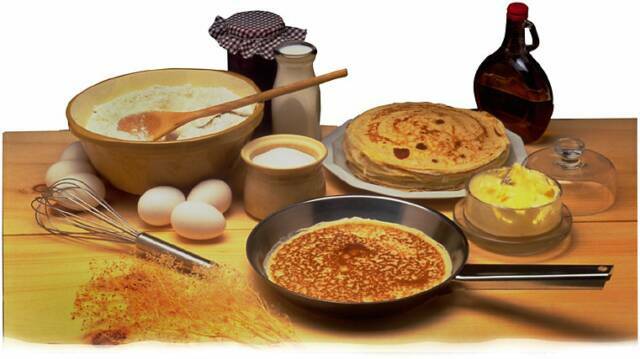 You made pancakes to eat before Lent began. Through the centuries, Christians all around the globe have celebrated the day before Ash Wednesday as Shrove Tuesday, or Pancake Day! This day is also called Mardi Gras, French for Fat Tuesday, because it is the last chance to eat up all the forbidden foods of Lent! The Carnival Season is celebrated around the world, everywhere from Trinidad and Tobago to Venice, Italy, to Rio de Janeiro, Brazil. In the United States, one of the largest celebrations of carnival is Mardi Gras in New Orleans. Countries in various parts of the world have many traditions for celebrating Carnival/Shrove Tuesday/Mardi Gras/Pancake Day. In England there is even a tradition of having Shrove Tuesday Pancake Races! This tradition, which dates back several hundred years, has even made its way to some cities in the USA. Shrove or shriven, are words that meant having your sins forgiven in the sacrament of reconciliation. As we mentioned above, it used to be a custom in many areas for Catholics to celebrate the sacrament of reconciliation the day before Lent began, which is where we get the term Shrove Tuesday. The church bells that rang Shrove Tuesday morning alerting everyone that it was time for confession got the nickname “pancake bells”. They were also a reminder to use up forbidden foods prior to the start of Lent. The story says that in the 1400s a woman in Olney England, making pancakes, heard the church bells ring. Concerned she would be late for church, she rushed out of her house with the pancake still in the skillet! You can watch a pancake race below. Another traditional food for Carnival and Mardi Gras is the Kings’ Cake, which we also associate with Epiphany. King's Cakes can also be purchased closer to Shrove Tuesday at many bakeries and grocery stores. But you can also make one at home. 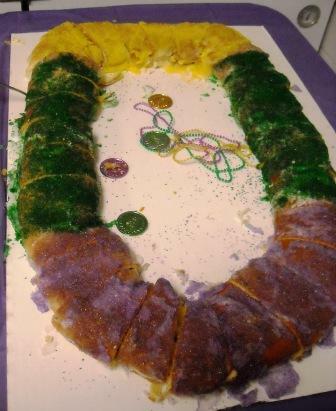 Here is a traditional recipe, which also includes the history of the King Cake. And here is another recipe site. There are some interesting sites on the web which provide great information for educators about Carnival. The Museum of International Folk Art developed good resources in conjunction with the traveling exhibition ¡CARNAVAL!, that was produced at the Museum in collaboration with the UCLA Fowler Museum of Cultural History. ¡CARNAVAL! highlights living Carnival traditions in eight different cities and towns in Europe and the Americas where Carnival is celebrated. The Smithsonian has created lesson plans about the masks worn by Carnival revelers in Puerto Rico. These lessons are divided into grades K–2, 3–5, 6–8, and 9–12. Flour is the staff of life. You can learn about Shrove Tuesday traditions in Ireland here. Pea soup is a traditional Shrove Tuesday fare in Finland, and in Poland, they celebrate Tlusty Czwartek (Fat Thursday, the Thursday before Lent). They call this day Paczki Day, because of the type of pastry they eat on this day. Many bakeries and groceries across the USA usually sell Paczki close to Shrove Tuesday. Find out more about Paczki Day and find traditional Paczki recipes here. make the ashes which will be used the next day, on Ash Wednesday. 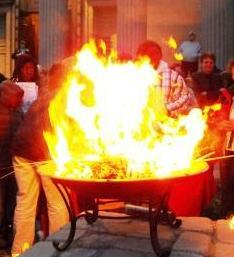 Some parishes have a public prayer service where the entire congregation can come to celebrate prayer and the burning of palm. Prayer might even be followed by a Shrove Tuesday Pancake Supper at the church. 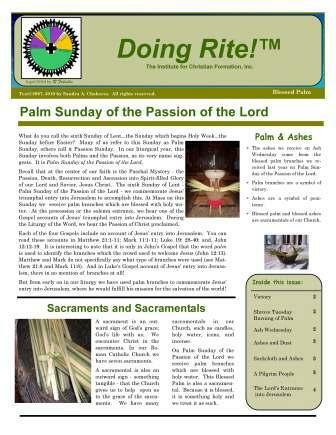 Below you can download our bulletin about Palms and Ashes, which explains the symbolism, history, and theology of Shrove Tuesday, Ash Wednesday, and Palm Sunday. 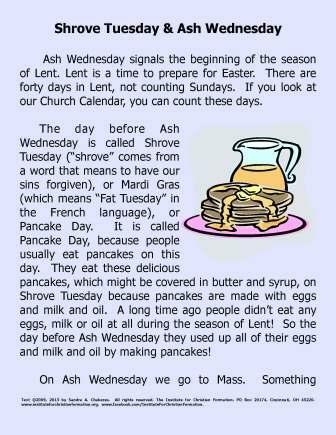 You can also download our children’s bulletin about Shrove Tuesday and Ash Wednesday. 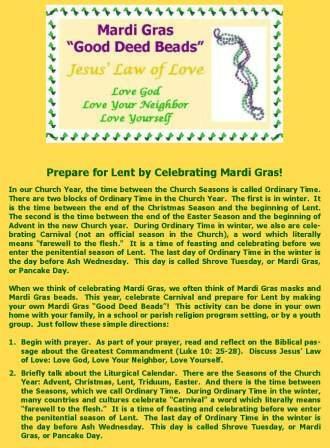 Click on the image above to download our ICF craft/lesson plan, Mardi Gras "Good Deed Beads"
Here at the Institute for Christian Formation our favorite craft during the Carnival season is to make Mardi Gras “Good Deed Beads.” What would Mardi Gras be without beads? 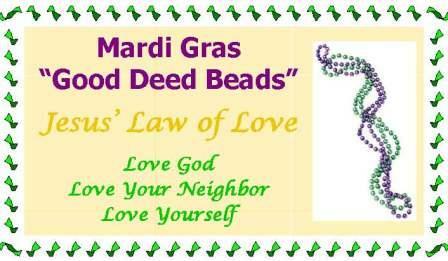 And with our craft, the “beads” are directly connected to living Jesus’ Law of Love. You can download our directions for this craft/lesson plan below. This can be used in your home with your own children, or in your classroom or youth gathering. Carnival in our northern hemisphere occurs during the dark, cold wintertime. So it is a natural time to gather inside with family and friends to tell stories and have parties. Keep the carnival season well in your own home - your Domestic Church. Gather together with your family and friends and neighbors to tell wonderful traditional fairy tales, and to tell your own stories, as well. Have festive meals. Celebrate with a traditional King's Cake. Keep the wonderful Feast Days of Winter Ordinal Time. As a family, make some Mardi Gras decorations for your home! Make merry, as this is a foretaste of what we will be doing in heaven for all eternity - singing God’s praises and rejoicing at the feast at the Heavenly Banquet Table!